Hi everyone! I’m here to tell you about something we’re calling the Quality Time Netrunner Gala Day. When we organised the Hadrian’s Wall Tournament, we wanted it to be as inclusive as possible. We assured people that all levels of competitiveness and experience were welcome, set out a code of conduct – lifted almost entirely from the ANRPC – and allowed people without a full card pool to proxy things they were missing. I think these were all positive things to do for a casual tournament but, in a way, we were still the point. Regardless of assurances of a pleasant time being had by all and relaxing some of the requirements of a more formal event, it was still a tournament; we were still playing timed rounds of Netrunner, awarding points, and announcing a winner. I have a friend who doesn’t go to tournaments. While it’s mostly due to being one of those people with a life outside Netrunner that you hear about, they’ve also expressed preferences for the way in which they like to play which doesn’t gel with competitive organised play. Some people – regardless of their in-game confidence – just don’t want to play in tournaments. Partially on reflection on this and partially in response to the debate that flared up late last year around the casual/competitive divide, we decided to try and organise something a bit different, something that wasn’t just another form of structured competition. While there was some Lag Time between intention and execution, we’re now ready (and very pleased) to bring you the first Quality Time Netrunner Gala Day! What can you do at the Netrunner Gala Day? Well, play Netrunner, of course! Our intention is to retain the casual atmosphere of your normal weekly meet-up with the excitement and sense of occasion normally reserved for tournaments. As well as providing a lovely venue – with fully stocked bar, of course – for players to meet new people, we’ll be organising a number of Netrunner-based activities you can drop in and out of throughout the day. 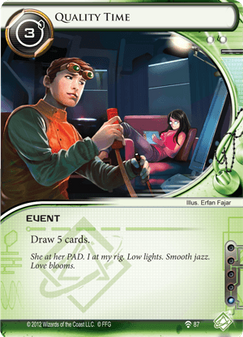 A teaching table: if you have a friend you’ve been trying to get into the game, or are a new Netrunner player yourself, experienced Edinburgh players will be on hand with teaching decks throughout the day, eager to introduce people to this fantastic hobby. A draft using Black Lion’s cube: if you haven’t played Netrunner in draft-format before you’re missing out. Forget agonising over whether John Masanori or Earthrise Hotel will be your 45th card; try agonising over whether Deep Thought or Tri-Maf Contact is likely to be more of a liability in bringing you to the requisite 30. Step up to the Jank table: here you can face off against one of the country’s finest brewers of nonsense – the winner here isn’t the person who scores seven agenda points, it’s the person who makes their opponent laugh the most. All this relaxation and camaraderie lulling you to sleep? Give yourself a jolt at the winner-stays-on ID-Swap challenge table. If you think you’ve got a switch that would break the game here’s where to find out if you’re right. A Netrunner quiz: test your knowledge of the game and the world in which it takes place! A friendly and safe space to play: if you want to grab a fresh face for a game, we’ll have tables set up to let you do that, and rules experts (nerds) around to help you with any queries. It'll be a great chance to get a fresh pair of eyes on your latest tournament deck to help you tune it or marvel at the bizarre combo you've built. Maybe “Guess the weight of the Dinosaurus”? This last one is reliant on Seamus learning how to bake cakes. Beyond that, we’re more than open to suggestions for other fun activities that we could include so if you have a suggestion please let us know! Attendance is free with small charges for some of the side events which will be confirmed closer to the date. So, if that all sounds good to you, please join us at the Victoria Park Hotel in Edinburgh on Sunday 17th of July from for cyber-crime and merriment. 10am-7pm (ish) on the 17th of July, 2016.